On a humid summer day, when the heat is cloying and you need a light refreshing meal this grilled chicken salad does the trick. It only takes 30 minutes to whip up this crunchy green heap of yum. Below are my suggested toppings but please leave comments below with suggestions on what you’d like to have on your salad. This is a great dish to make when you’ve made a roast chicken the night before or have any leftover chicken in the house. All the same ingredients go great in a wrap as well. *There are no real measurements below as this meal can be made for 1 or more. I trust you can judge how much you will need of each depending on how many you are serving. I just suggest at least one piece of chicken per person. 1. Preheat the oven to 350 F or 180 C (160 C fan). 2. 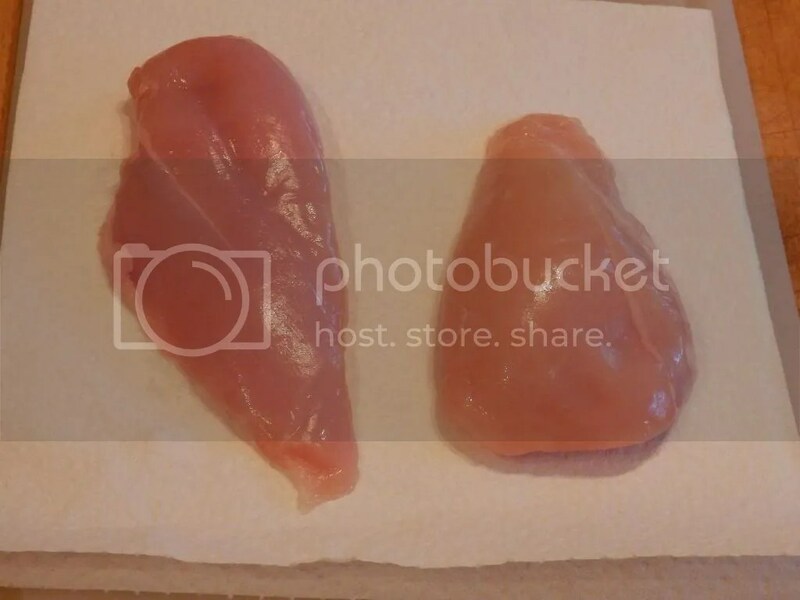 If using chicken pieces such as legs, thighs to breasts (I used breasts) pat the pieces dry with a paper towel. This will help the chicken brown in the oven. 3. Place the chicken in a roasting tray or on a cookie sheet and coat lightly with extra virgin olive oil and salt and pepper. Make sure it is coated on both sides. Make the chicken for 30 minutes or until there is no pink and the juices in the chicken run clear. 4. While the chicken is in the oven you can start to assemble your salad. 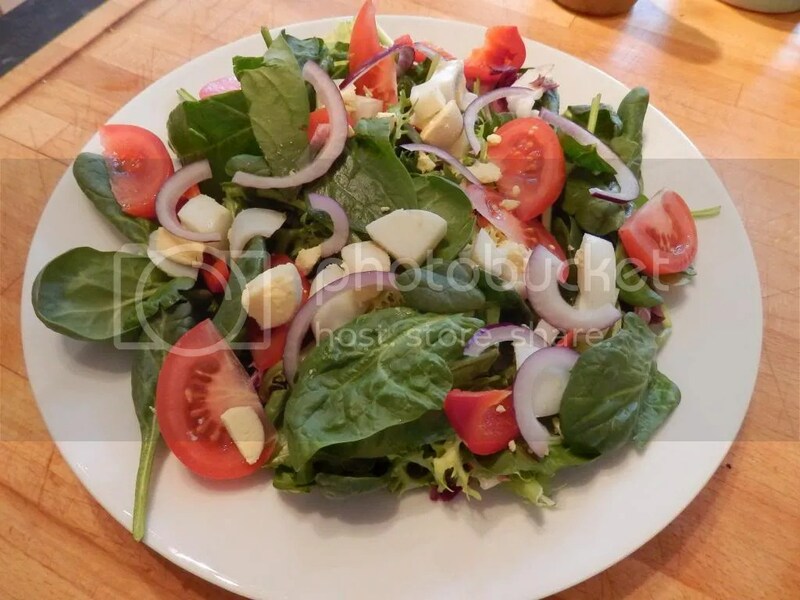 I used tomatoes, red onion, hard boiled eggs, spinach and a bag of salad mix. 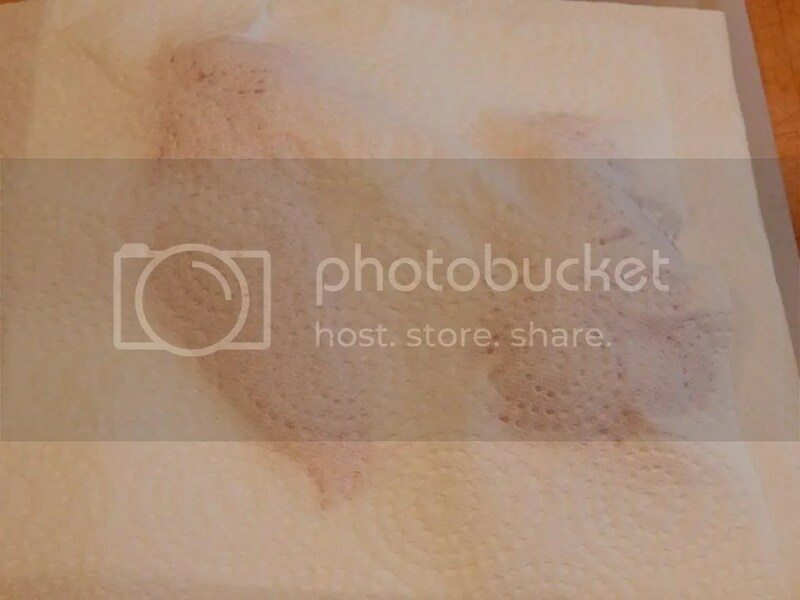 If making well in advance then simply cover each plate with a damp paper towel and keep chilled. You can also make a large salad bowl but again cover with a damp paper towel and chill. 5. 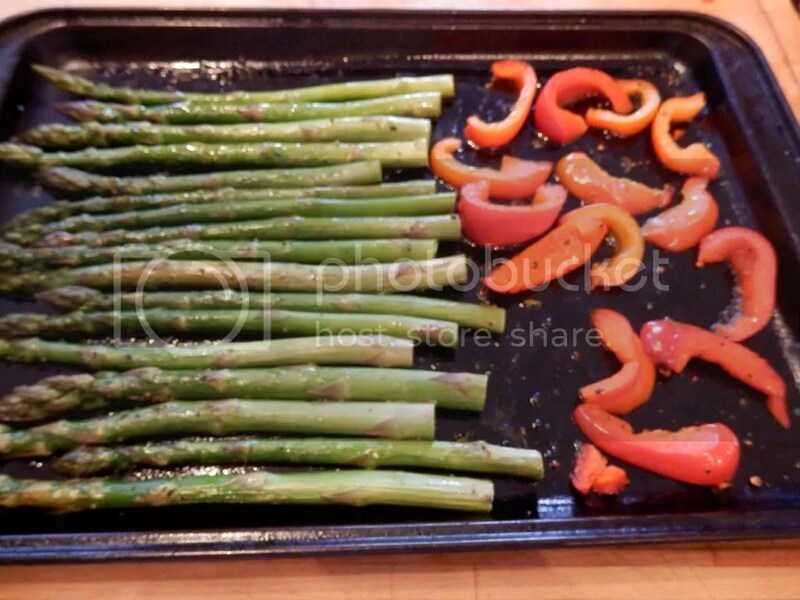 About 5 minutes before the chicken is due to finish in the oven put your asparagus and peppers on a roasting tray. I like both roasted and raw pepper so I kept some on the side. Coat lightly with extra virgin olive oil and salt and pepper. Pop into the oven just before the chicken is done. 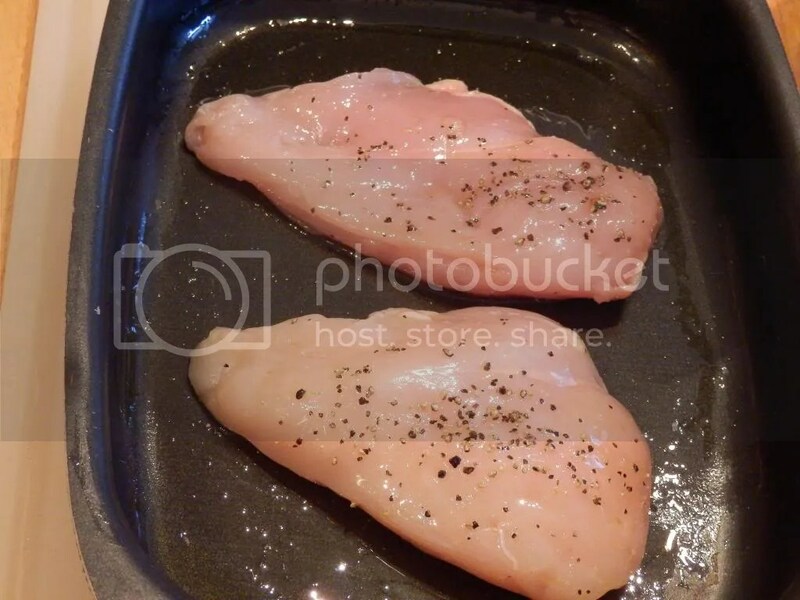 When the chicken is done, remove it from the oven and put the oven to grill. It should only take a few minutes to cook the veggies but watch it to make sure it doesn’t burn! 6. Pull out the chicken when it is cooked through and allow to cool for a few minutes. Then take two forks and shred or tear the chicken into strips. 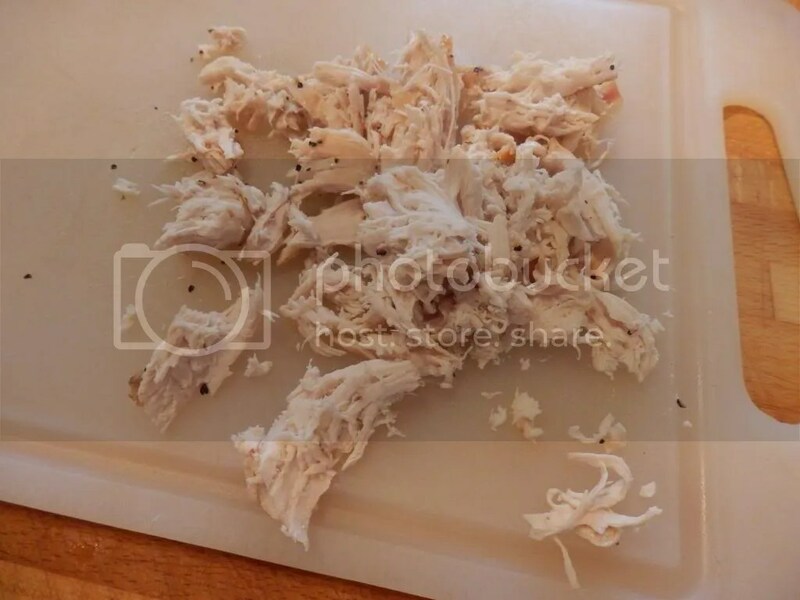 You can also cut the chicken into strips if you like but I like the more natural look of tearing it. 7. 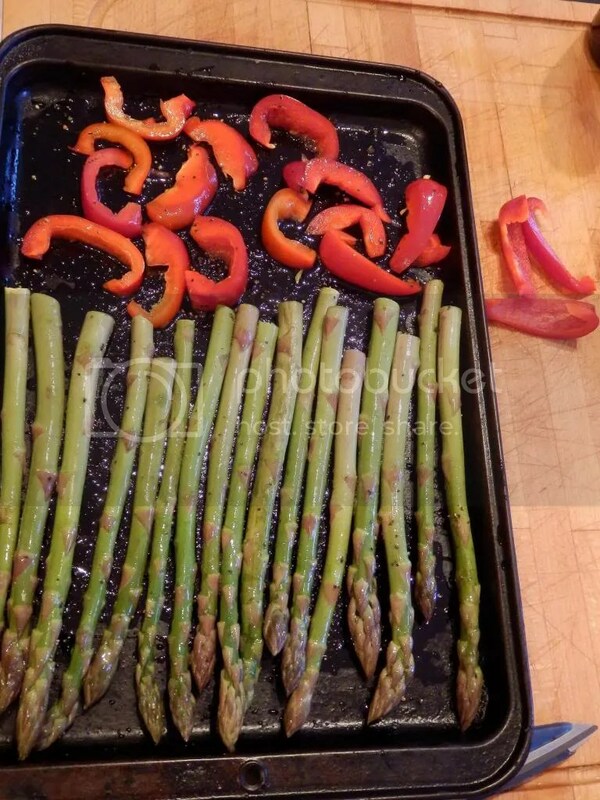 Pull out your asparagus and peppers when you can poke with a knife and the veggies are tender all the way through. 8. 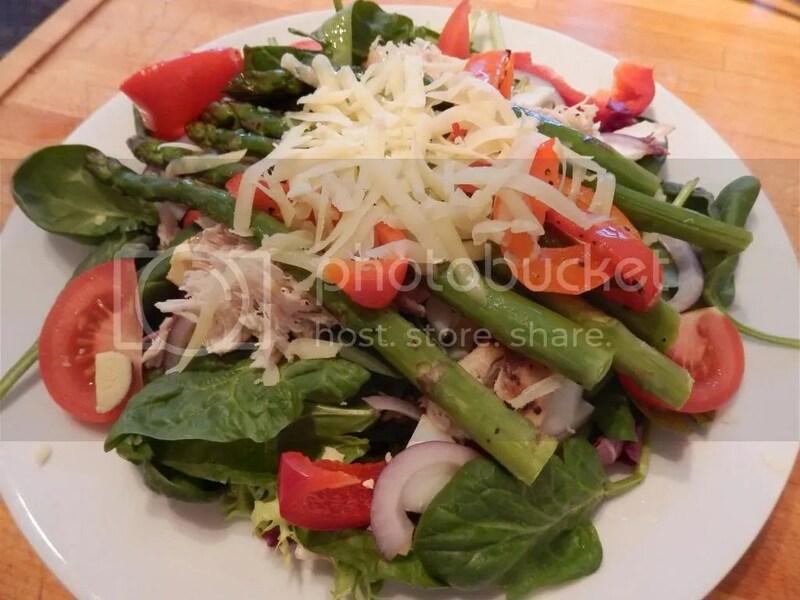 Top your salad with the chicken, asparagus, peppers and some shredded cheese. Use your favorite dressing, I used a low fat vinegrette, to finish.